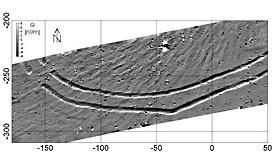 JESSY SMART is a novel measuring device for fast three-dimensional geomagnetic mapping of hidden subsurface anomalies. approx. 10 meters. 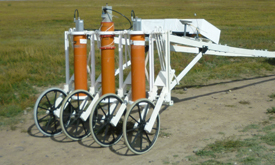 The sensors are mounted onto a cart which can be moved attached to a motor car or alternatively pushed along manually. To achieve the highest detection rates the system applies the most sensitive sensors presently available, Superconducting Quantuum Interference Devices (SQUIDs). Archeology: Nondestructive detection of hidden anthropological remnants: e.g. metal objects, building structures, cavities, charcoal, ashes, clay, ceramics, bricks. Building ground analysis: Remnants of foundations, fillings, metal materials, power lines, pipelines, unexploded ordinances, ground contaminations. Geology: detection of geological formations, river structures, natural magnetic anomalies, natural resources. Localisation of unexploded ordnances: unexploded bombs, weapons and munitions.